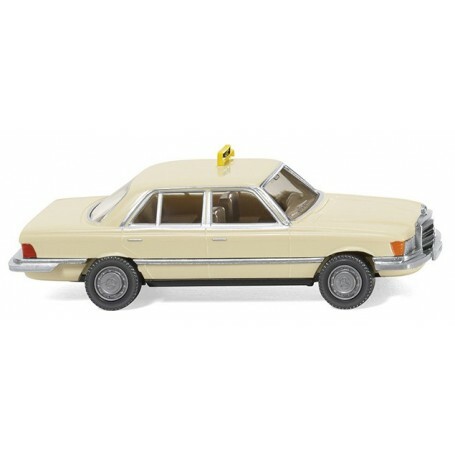 Taxi - MB 300 SD, 1978. Upper and lower body parts light ivory, chassis black. Front bumper element and radiator grille painted silver. Interior with steering wheel crème-beige. Taxi sign in traffic yellow with black 'Taxi' lettering. Window frames painted silver. Mercedes-Benz star on rear as well as model designation '300 SD' and 'Turbodiesel' printed silver. Side door handles painted silver.